What If Using TFS Proxy Was as Easy as Making a Get? There is a little known feature from TFS2010 that hasn’t gotten a lot of press and has only recently been added to MSDN library. It’s TF PROXY, one of the commands for the TF command line tool. This tool is meant for developers working with source control files from the command line, but it’s also got functionality that network administrators or anyone who is responsible for getting developers to use a particular proxy will find useful. The proxy command has two purposes, and each purpose is aimed at a different type of user. As a developer, you can use the proxy command to configure your client to use a proxy server or to override the network defaults for a proxy server. This task is similar to configuring Team Explorer to use a proxy. As a network administrator, you can use the proxy command to add and manage records about the location of various proxy servers within your deployment of Team Foundation Server. You can use these records to help developers configure their workstations to use a proxy. 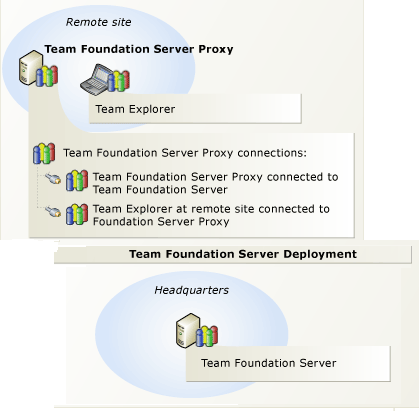 If you define a global proxy, Team Foundation Server can automatically redirect developers to use it. If you have a complex network topology with multiple Active Directory domains in various geographic locations, you can set up multiple records and associate each record with a particular domain. These records can then help you automatically direct developers from each geographical location to the appropriate proxy for their location. The cool thing about this command is that if you use the administrative feature to set a global proxy record for your domain as the default, once a developer in that domain performs a get, their workstation will automatically get configured to use the proxy. Categories: Tips | Tags: administrators, developers, source control files, tf command line, tfs proxy, tfs2010 | Permalink. Perhaps! Send me the details and I’ll see what I can do.